The level gauges found on the Blichmann BoilerMaker kettles are extremely useful throughout the brewing process in all three kettles. We use it to measure the amount of wort collected or boiled-off in the Boil Kettle, strike water added to the Mash/Lauter Tun, and water heated in the Hot Liquor Tank. Being able to see the liquid level at a glance in the Mash/Lauter Tun makes it easy to match flow rates when sparging (more on this later). It's one piece of equipment that's very handy to have on all three kettles if we are to brew beer that is repeatable and consistent from batch to batch. The stainless guard on either side helps protect the sight glass. The kettles are large, so having this extra protection is welcome insurance as we've certainly banged into the guard more than once as we clean up the kettles and move them around. We've yet to see a third party sight glass that can be added to pots or keggles that has protection like this, which means you have to be extremely careful when moving or cleaning them. The laser-etched volume graduations are fairly easy to read and won't wear off. You'll be able to measure to within approximately 1/4 gallon without difficulties which (as mentioned previously) will help with brewing beer that is repeatable and consistent from batch to batch. Third party sight glasses cannot have these volume graduations as every kettle is different. You have to add your own with tape or marker, which wear off or fall off with use. The sight glass itself is made of heat resistant borosilicate glass, which does not cloud or scratch. Most other sight tubes we've seen become hazy after a few months of use. A sight glass that remains transparent year after year means that it's always quick and easy to see the liquid level - especially true when the liquid you are measuring is clear, like the water in the hot liquor tank. A brush and Allen key are also included. 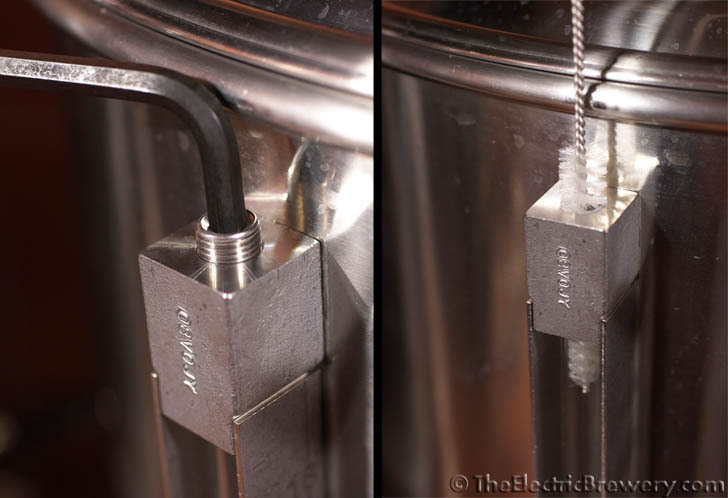 The Allen key allows for quick removal of the nut from the top of the level gauge for cleaning with the brush. There is no need to remove the sight glass for cleaning. Incidentally, the long brushes are also the perfect size and length for cleaning the insides of corney keg dip tubes. 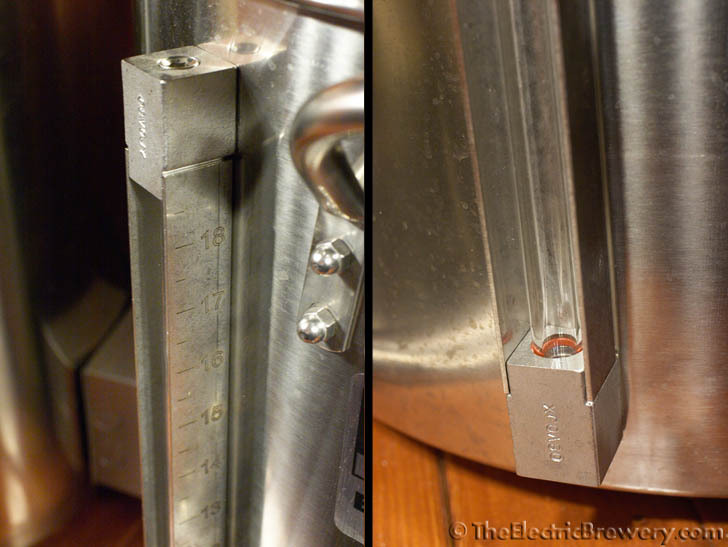 The level gauge is not available for sale separately, likely because dozens of different lengths and graduations would have to be offered to accommodate the different kettle sizes that exist.